With the Terex V200 and Terex V300 both weighing in at 6,600 Lbs. and having 50 and 60 Horsepower, these smaller machines need help to keep up with the big skid steers on job sites. 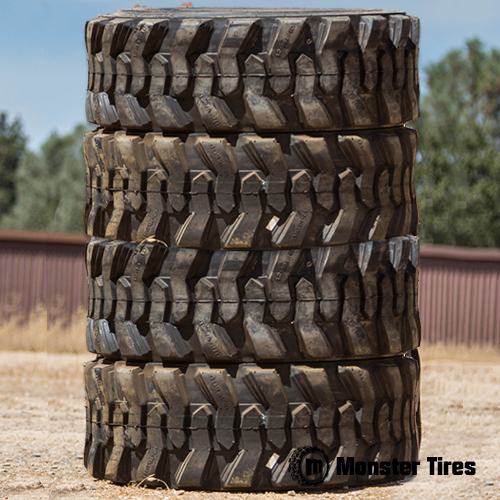 Monster Tires knows one of the easiest ways to stay competitive with bigger machines is to have a good set of tires, not only will you feel more stable on hills but they help you get more material per load by having the grip to push into the material. Contact Monster Tires today to get your set of Terex V200 Skid Steer Tires or Terex V300 Skid Steer Tires on the way now!